Nature Stamps are one of my favorite images and this Mountain Elk from Cornish Heritage Farms has just been begging to get inked up. I had to do a little cleaning of my Color Wash Sprays before I could actually complete my card - as the nozzles were a bit clogged and they sprayed all splotchy - but a simple wipe of the nozzles with a cloth cleared that right up. I always find it easier to stamp my images first when using the Color Wash Sprays, that way I get the color somewhat close to where I'd like it to be. 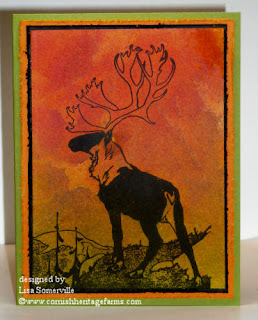 The Elk is stamped in Black Archival on watercolor paper, then sprayed with Lettuce and Terra Cotta Color Wash using the Cling and Scrunch Technique - thus the look of clouds in the background. Thanks for stopping in today - be sure to check back tomorrow for Blogger's Challenge - our theme this week is Birthday! Very pretty. I like your color combination. Lovely! Tell your son Happy Birthday! It's my b-day too!